DUFC were on the wrong end of a 66-33 hiding at the Aviva this afternoon. Dublin University Football Club (DUFC) travelled to Ulster Bank League champions Lansdowne today, put 33 points on the board and played some thrillingly incisive rugby at various points on a bitterly cold afternoon. The problem, however, was that they conceded double that, run ragged by their hosts, who exposed gaping holes in DUFC’s defence and registered ten tries in a 66-33 win that helps them extend their winning streak to eight games. It’s difficult to know exactly where the truth lies in any examination of a game that, for Trinity at least, lurched from woeful ineffectitude one minute to excellence the next – and then frequently back again. Shot through the DNA of Tony Smeeth’s players is an insatiable urge to play running rugby at all costs, and they did this when the score was 7-0, 42-5, 66-12, sticking to the plan even as the hosts ran riot around and through them. It’s maybe most convincing to argue that, from the first whistle, Lansdowne beat DUFC – comprehensively – at their own, carefully cultivated, running game. Within minutes the hosts had their first try, Peter Sullivan galloping free on the left off the back of a lineout on halfway. Always reliable, Scott Deasy added the extras. 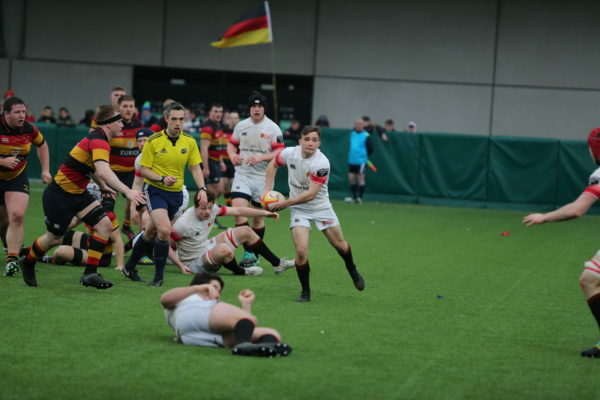 This was the reverse of a fixture between these two sides before Christmas that was far closer – Lansdowne eked out a 16-7 win in College Park that afternoon – than today’s proved. A Christmas hangover from Trinity, perhaps, but whatever the explanation, Lansdowne almost immediately had a second try, Sullivan intercepting a looping pass and jogging in for another. A third Lansdowne try, less than two minutes later, will surely have left Smeeth scratching his head. This time it was Sullivan’s wing counterpart Daniel McEvoy who did the honours with a clever run after a slick move. Nine minutes in and – after another slotted conversion – Trinity were 21-0 down. The visitors, shell-shocked, nevertheless attempted to hit back – seemingly the only way they know how. James Fennelly directed operations as the students started playing some rugby of their own. For DUFC, the problem never seems to be an absence of ambition, or a lack of skill. It’s organisation that costs them against the sharper teams. This fact means they almost always score tries regardless of the opponent, and they got off the mark themselves after 15 minutes following a scrum on Lansdowne’s 22. Jack Kelly ran a marvellous line and, after juggling Rowan Osborne’s subtle slip pass, burst through a would-be tackler before he was grounded five metres out. With the hosts at sixes and sevens, Jack Dunne picked and galloped over. Fennelly’s conversion, well struck from a tight angle, bounced out off the upright. If things looked a little brighter for Trinity at this stage, then two minutes later they were left watching again as Sullivan touched down for his hat-trick. Positive in possession, DUFC looked helpless without the ball and by the 20-minute mark Lansdowne were 35-5 up. Faced with an overlap, Fennelly did the only thing he could to prevent the hosts crossing the whitewash once again. He was sin binned for his deliberate knock-on and the referee awarded a penalty try. DUFC remained stubborn. Some superb rugby between Osborne, Kelly and Philip Murphy had Lansdowne worried, but they cleared their lines in the end. Up against a far more physically developed side, Trinity were nevertheless making yards and Donal Liddy almost got away before an ankle tap brought him to ground. Nevertheless, there was never the sense that Trinity had tidied up in defence and Lansdowne scored a sixth try with five minutes remaining in the first half when McEvoy charged onto an incisive pass from scrumhalf Alan Bennie. Johnny McKeown, perhaps lent strength by frustration, clawed another back for Trinity just before the break, contemptuously seeing off Ian Prendiville’s attempted tackle before racing away from two more defenders and touching down. Second-half tries from Prendiville, Aaron Conneely, Deasy and McEvoy (again) – mostly scored in frustrating fashion from Trinity’s perspective but always from excellent rugby on Lansdowne’s part – left the scoreline reading 66-12 with 15 minutes remaining. Now DUFC, 54 points down with a losing bonus point looking highly unlikely, showed why it is they continue to surprise even when they’re on the wrong end of a hiding. Sustained pressure, abetted by strong play up front and tireless running from James Hickey and others, helped them over the line for a third try, which Fennelly kicked. Substitute Ryan Baird clinched a bonus point when he picked and drove over for a fourth try after a great break. Lansdowne, their lead never even slightly under threat, perhaps took their foot off the gas, but either way DUFC deserve some credit for the way they continued to press until the end, and captain Colm Hogan dived over with the game’s last action after a clever Hickey break freed up space.